I wish I could have an "A-ha" moment. Deep down inside I really have an urge to change my life, do something different and achieve my career goals. Only problem is I don't know what that career is. My mind has changed so many times that I have no clue anymore of what I want to do. I'd really like to start my own business, my ultimate goal would be some kind of bake shop. But, I'm not financially ready for that step yet. So my mind wanders to other things. Personal Trainer, Real Estate Agent, something in Magazine Design, or even going to school to get my Masters...in what, I don't know. And with times being a little tough these days I feel like I would like to have a second source of income. I don't necessarily want to get another job. I'd like to find something easy that I could do in my "afterwork" hours, that doesn't have me working another 5 hours at night. I just have so many thoughts running through my mind and I don't know how to sort them, where to take them, or what to do with them. I think about the woman that I want to be. Successful, financially independent, respected, entrepreneur, and innovative. Its connecting the dots to get to that woman that I'm having problems with. I just keep praying that while I'm having my coffee one morning I will all the sudden say "A-ha" I know now what it all means! Until that day comes, I had an "A-ha" moment with this cake. 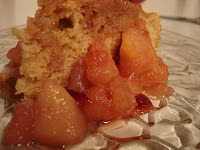 I saw a recipe on Epicurious.com for Brown_Sugar Spice Cake with Caramelized Apples. The cake sounded so warm and comforting, some thing to help lift my spirits. Only problem was I didn't have any apples. Think, think, think. A-ha!!! 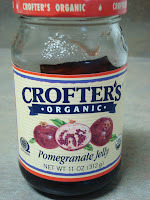 I've had this jar of Pomegranate Jelly forever, and a can of pears in the pantry that needed to be used. 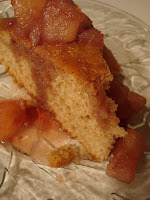 So I figured I mix them together for my topping, and what do you know, I had one of the best cake I have ever, ever made! The flavors were so reminiscent of fall, and matched perfectly together that I found myself dying for another piece. At least I had some sort of an "A-ha" moment. Put oven rack in middle position and preheat oven to 350°F. Lightly butter and flour cake pan, knocking out excess flour.Whisk together flour, baking powder, baking soda, salt, and spices in a bowl. Beat together butter and brown sugar in a large bowl with an electric mixer at medium speed until pale and fluffy. Beat in egg until combined. Add maple syrup, sour cream, and vanilla and beat until combined well. Reduce speed to low and add flour mixture, then mix until just incorporated. Spread batter in cake pan and bake until cake is golden brown and a wooden pick or skewer inserted in center comes out clean, 35 to 40 minutes. Cool in pan on a rack 10 minutes. 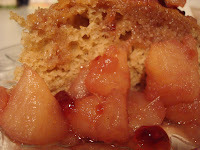 Place both the jelly and the pears in a bowl and microwave for 2 minutes, or until jelly have liquified. Mash pears, slightly to add texture. Spoon mixture over cooled cake. I'm not sure how old you are, but I'm guessing you are still young, like me. Don't give up! We still have time to decide before "growing up." If you need help, maybe you could try new activities. Or travel to new places. Honestly, I didn't think I would be big into video production until I took a class.